W hy did the Na zis Le Tone Wei co mm it m as sm ur de r? 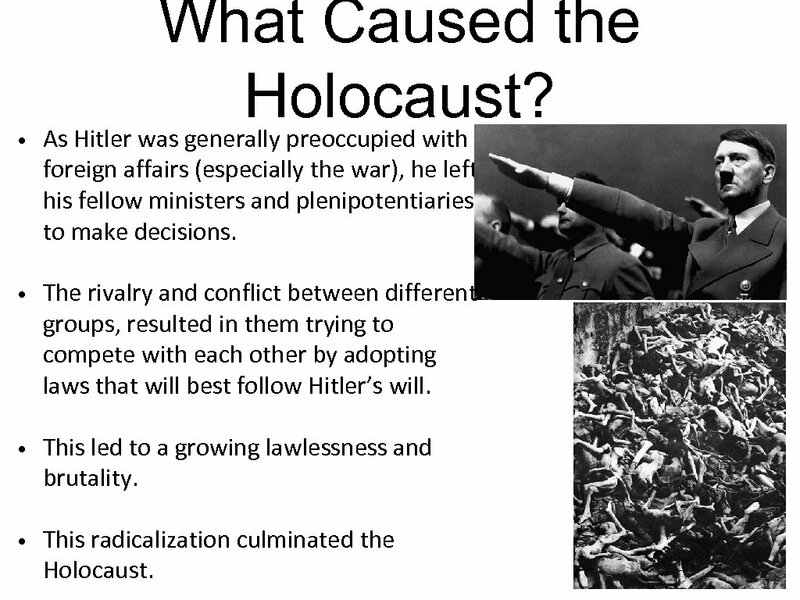 • What Caused the Holocaust? As Hitler was generally preoccupied with foreign affairs (especially the war), he left his fellow ministers and plenipotentiaries to make decisions. 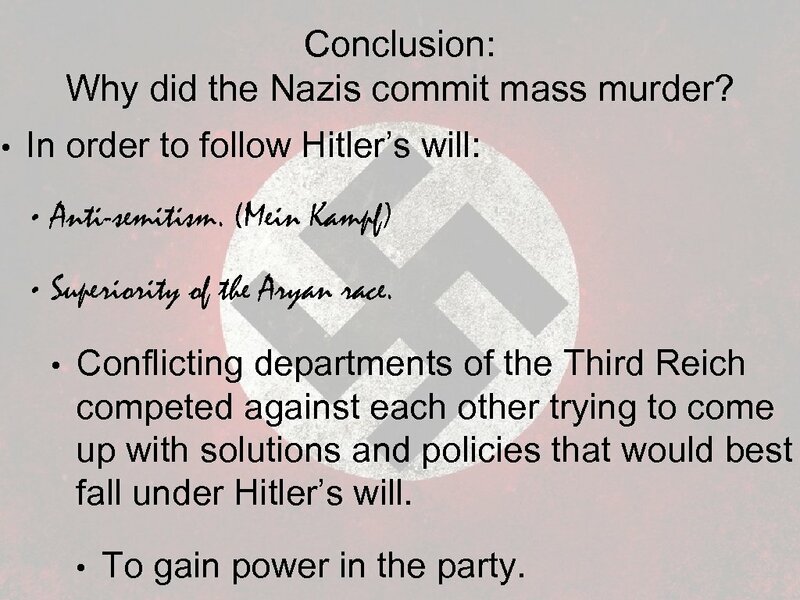 • The rivalry and conflict between different groups, resulted in them trying to compete with each other by adopting laws that will best follow Hitler’s will. • This led to a growing lawlessness and brutality. • This radicalization culminated the Holocaust. 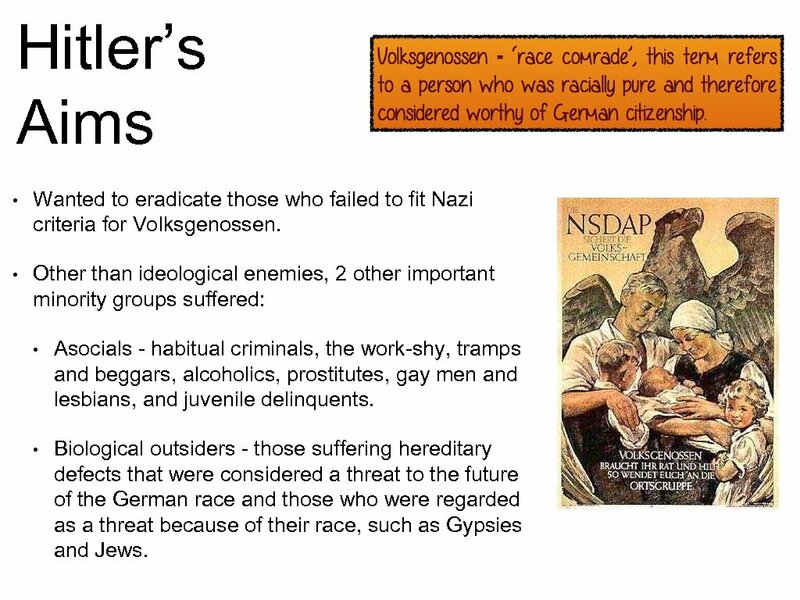 Hitler’s Aims • Wanted to eradicate those who failed to fit Nazi criteria for Volksgenossen. • Other than ideological enemies, 2 other important minority groups suffered: • Asocials - habitual criminals, the work-shy, tramps and beggars, alcoholics, prostitutes, gay men and lesbians, and juvenile delinquents. 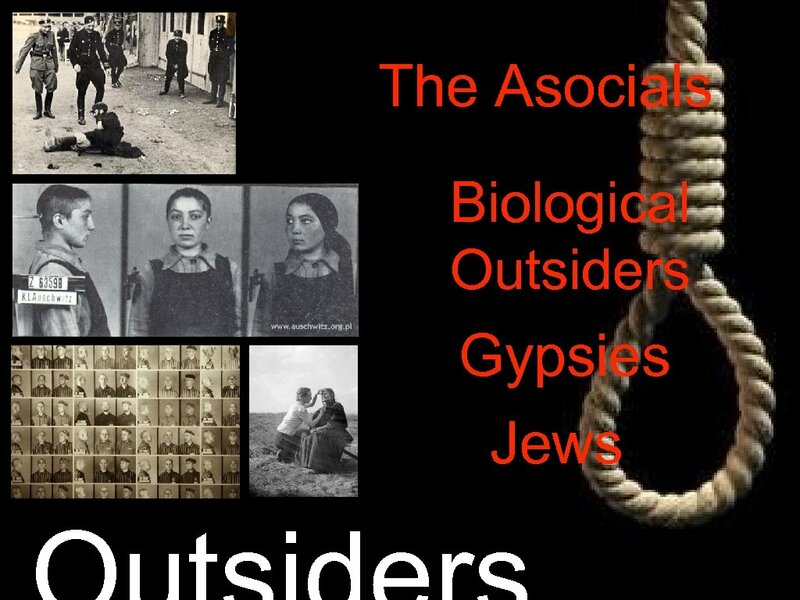 • Biological outsiders - those suffering hereditary defects that were considered a threat to the future of the German race and those who were regarded as a threat because of their race, such as Gypsies and Jews. Hitler’s Hatred Towards Jews "Once I really am in power, my first and foremost task • will be the annihilation of the Jews. 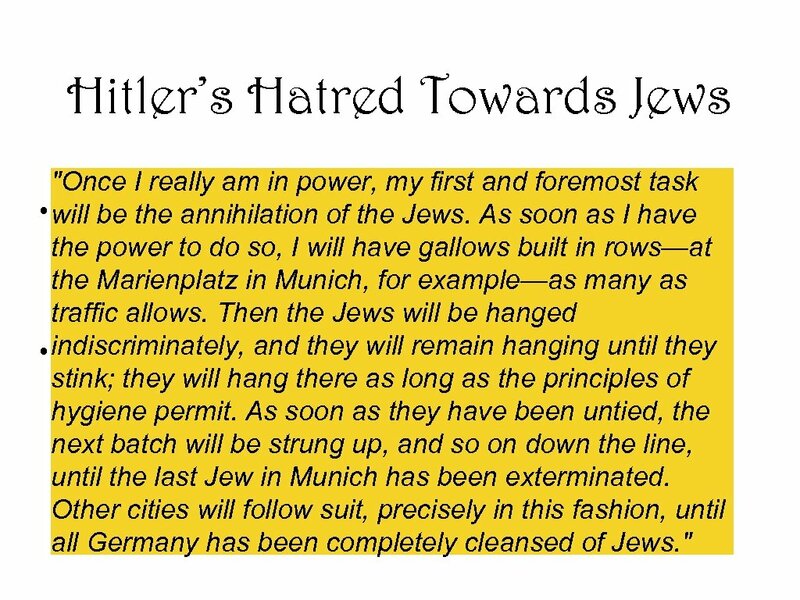 As of his I have Mein Kampf, gave warning soon as the power to do so, I will have gallows built in rows—at intention to drive them from Germany's the Marienplatz in Munich, for example—as many as political, Then the Jews and hanged traffic allows. intellectual, will be cultural life. • indiscriminately, 1922, he allegedly told Major As early as and they will remain hanging until they stink; they will hang there as long as the principles of Joseph Hell, at theas they a journalist: the time have been untied, hygiene permit. As soon next batch will be strung up, and so on down the line, until the last Jew in Munich has been exterminated. Other cities will follow suit, precisely in this fashion, until all Germany has been completely cleansed of Jews. " • In September 1933, 300, 000 to 500, 000 so-called beggars and tramps were rounded up. • Some (mainly the young unemployed) were given a permit (Wanderkarte) and had to perform compulsory work in return for board and lodgings. • The ‘work-shy’ were dealt with under the Law against Dangerous Habitual Criminals, 1933. 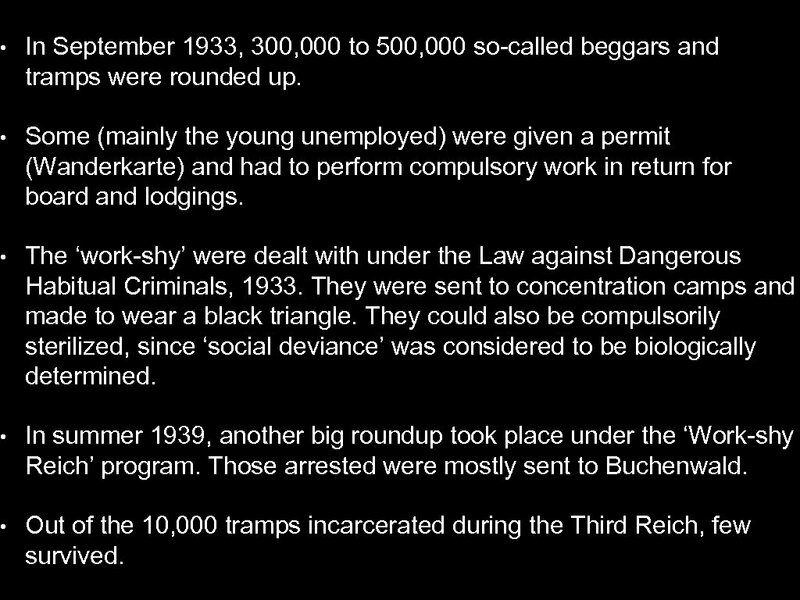 They were sent to concentration camps and made to wear a black triangle. They could also be compulsorily sterilized, since ‘social deviance’ was considered to be biologically determined. • In summer 1939, another big roundup took place under the ‘Work-shy Reich’ program. Those arrested were mostly sent to Buchenwald. • Out of the 10, 000 tramps incarcerated during the Third Reich, few survived. 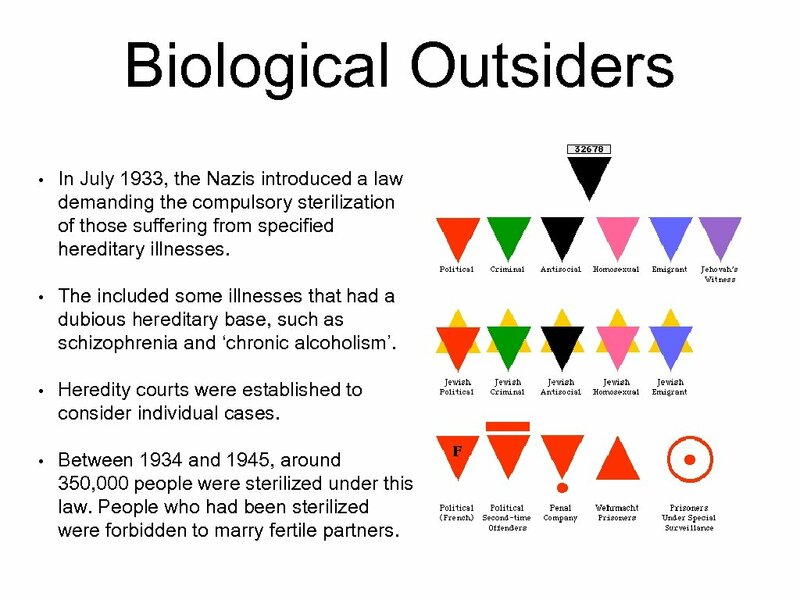 Biological Outsiders • In July 1933, the Nazis introduced a law demanding the compulsory sterilization of those suffering from specified hereditary illnesses. • The included some illnesses that had a dubious hereditary base, such as schizophrenia and ‘chronic alcoholism’. • Heredity courts were established to consider individual cases. • Between 1934 and 1945, around 350, 000 people were sterilized under this law. People who had been sterilized were forbidden to marry fertile partners. 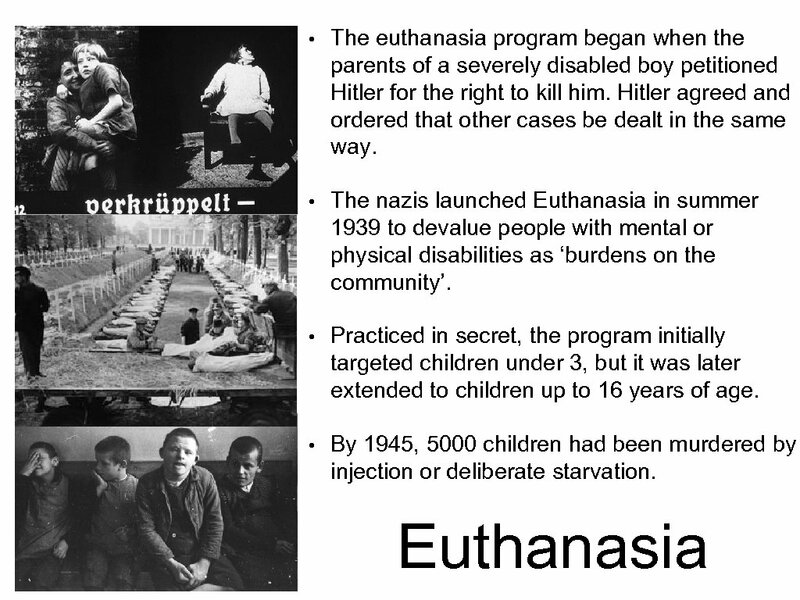 Euthanasia • In order to extend this program to adults, carbon monoxide gas was used in six mental hospitals in various parts of Germany. • Protests against euthanasia were led by the Catholic Bishop Galen. By August 1941, when the program was officially stopped because of public outrage, 72, 000 people had been murdered. 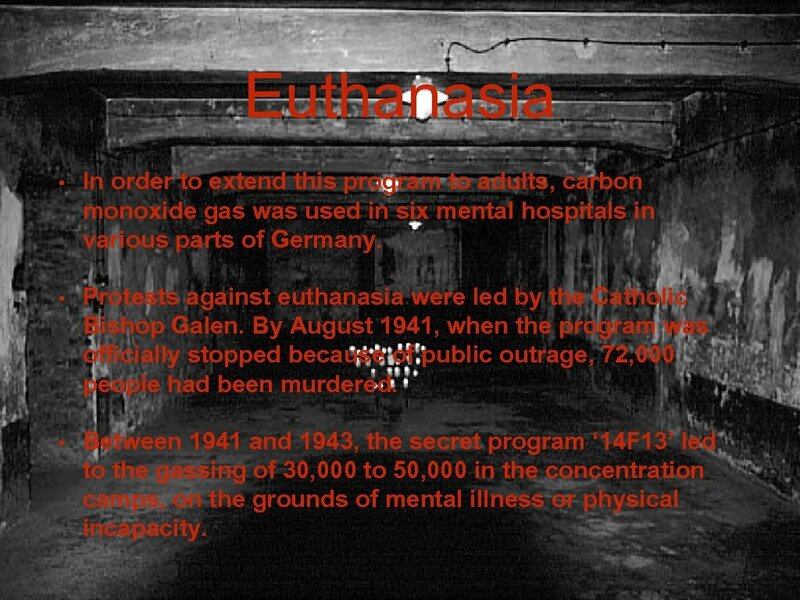 • Between 1941 and 1943, the secret program ‘ 14 F 13’ led to the gassing of 30, 000 to 50, 000 in the concentration camps, on the grounds of mental illness or physical incapacity. 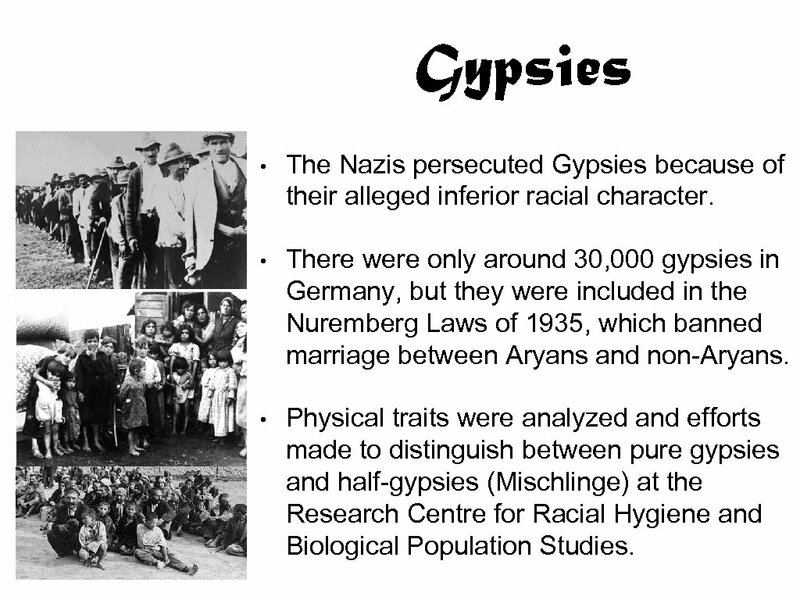 Gypsies • The Nazis persecuted Gypsies because of their alleged inferior racial character. 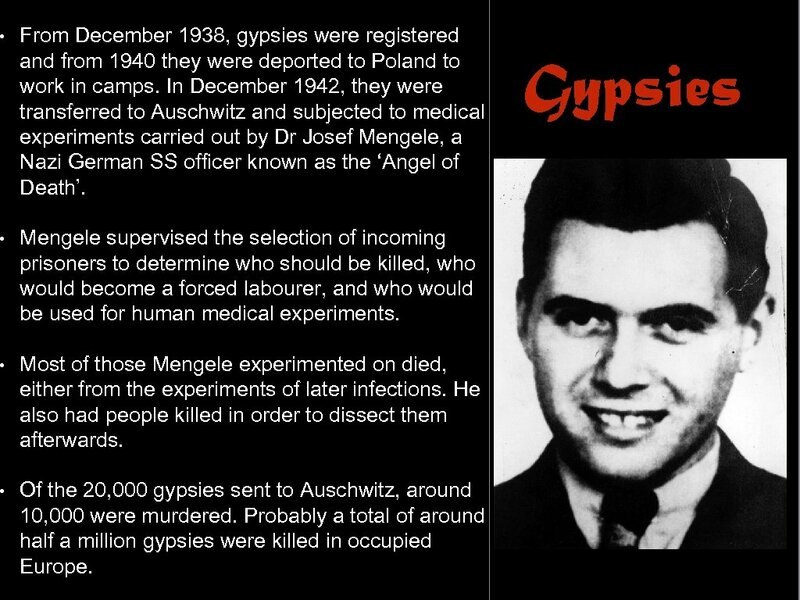 • There were only around 30, 000 gypsies in Germany, but they were included in the Nuremberg Laws of 1935, which banned marriage between Aryans and non-Aryans. • Physical traits were analyzed and efforts made to distinguish between pure gypsies and half-gypsies (Mischlinge) at the Research Centre for Racial Hygiene and Biological Population Studies. 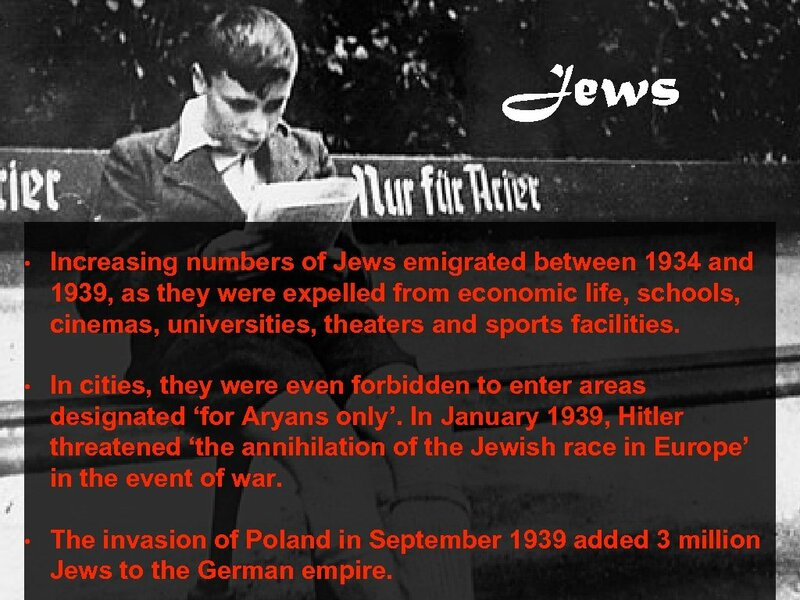 • Although there were only about 500, 000 Jews in Germany (less than 1% of the population), and most had been thoroughly assimilated into the German community, Jews were portrayed by the Nazi regime as a serious racial threat and the root cause of Germany’s ills. • The first state-sponsored act of persecution was a one-day boycott of Jewish shops and business in March 1933. • The government continued to issue contracts to Jewish firms, although Jewish civil servants were dismissed under the Law for a Restoration of a Professional Civil Service, 1933. 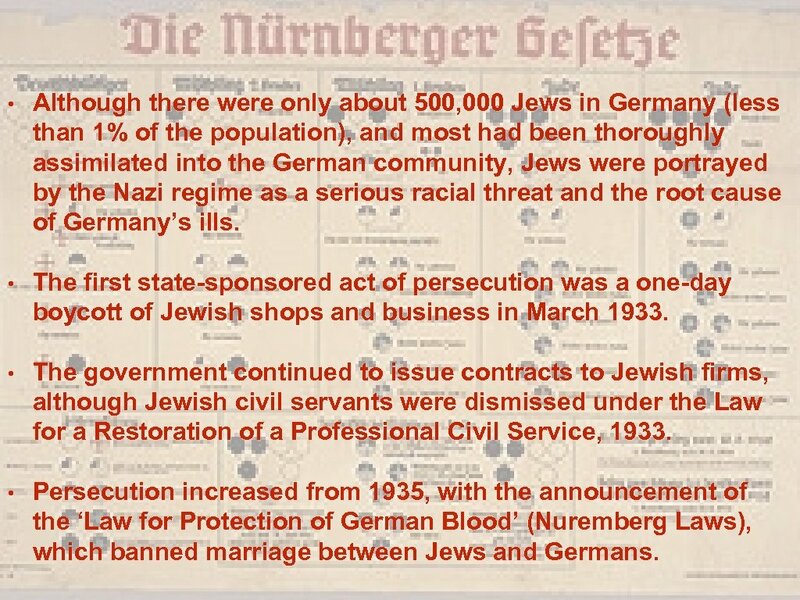 • Persecution increased from 1935, with the announcement of the ‘Law for Protection of German Blood’ (Nuremberg Laws), which banned marriage between Jews and Germans. Je ws • In 1938, persecution escalated as the regime grew increasingly radical: • Jews were no longer awarded public contracts; • all Jewish property valued at over 5000 Marks had to be registered and could not be sold; • Jews could no longer be employed in business; • Jewish doctors, dentists and lawyers were forbidden to offer services to Aryans; • all Jewish children were required to bear the names Israel or Sarah in addition to other names; • Jews were obliged to carry identity cards and have their passports stamped with a ‘J’. 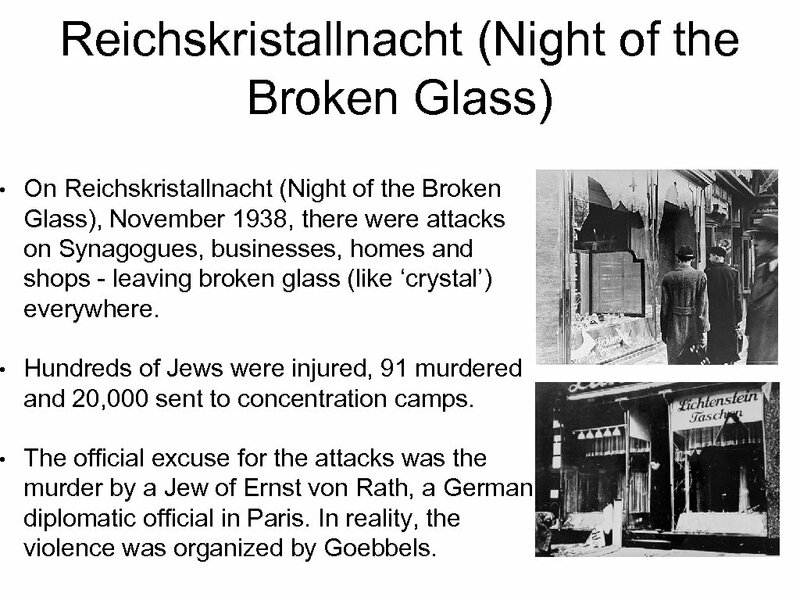 Reichskristallnacht (Night of the Broken Glass) • On Reichskristallnacht (Night of the Broken Glass), November 1938, there were attacks on Synagogues, businesses, homes and shops - leaving broken glass (like ‘crystal’) everywhere. • Hundreds of Jews were injured, 91 murdered and 20, 000 sent to concentration camps. • The official excuse for the attacks was the murder by a Jew of Ernst von Rath, a German diplomatic official in Paris. In reality, the violence was organized by Goebbels. 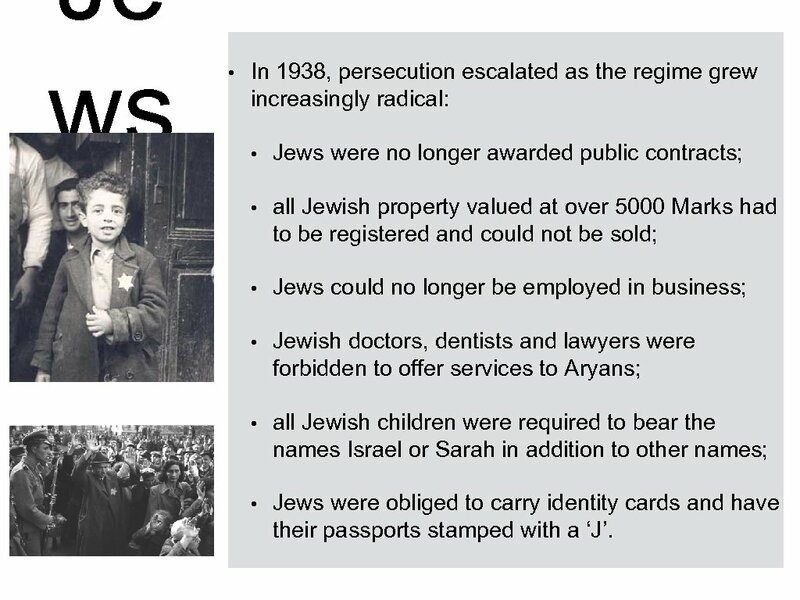 Jews • Increasing numbers of Jews emigrated between 1934 and 1939, as they were expelled from economic life, schools, cinemas, universities, theaters and sports facilities. • In cities, they were even forbidden to enter areas designated ‘for Aryans only’. In January 1939, Hitler threatened ‘the annihilation of the Jewish race in Europe’ in the event of war. • The invasion of Poland in September 1939 added 3 million Jews to the German empire. 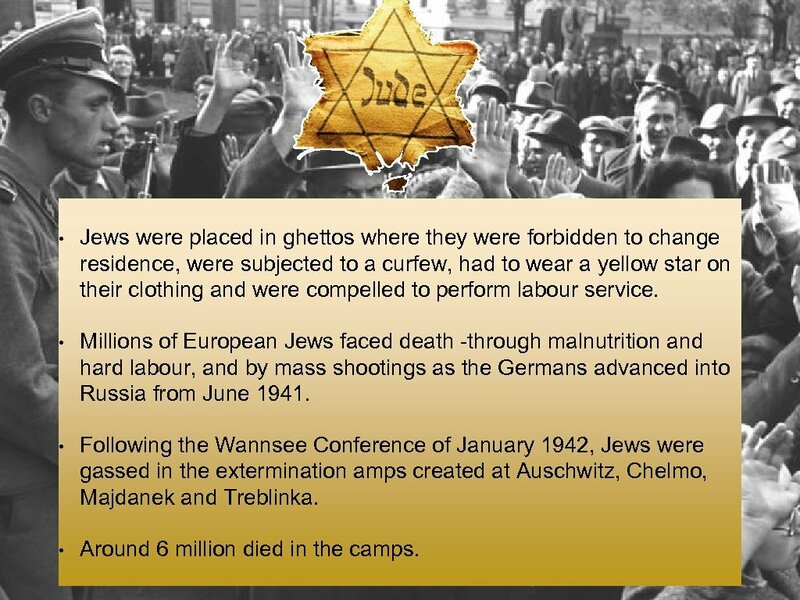 • Jews were placed in ghettos where they were forbidden to change residence, were subjected to a curfew, had to wear a yellow star on their clothing and were compelled to perform labour service. • Millions of European Jews faced death -through malnutrition and hard labour, and by mass shootings as the Germans advanced into Russia from June 1941. • Following the Wannsee Conference of January 1942, Jews were gassed in the extermination amps created at Auschwitz, Chelmo, Majdanek and Treblinka. 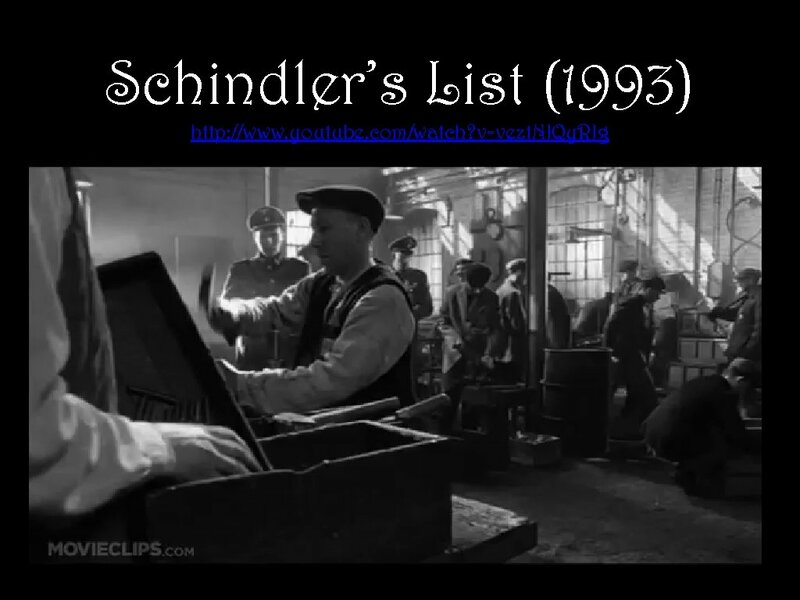 • Around 6 million died in the camps. 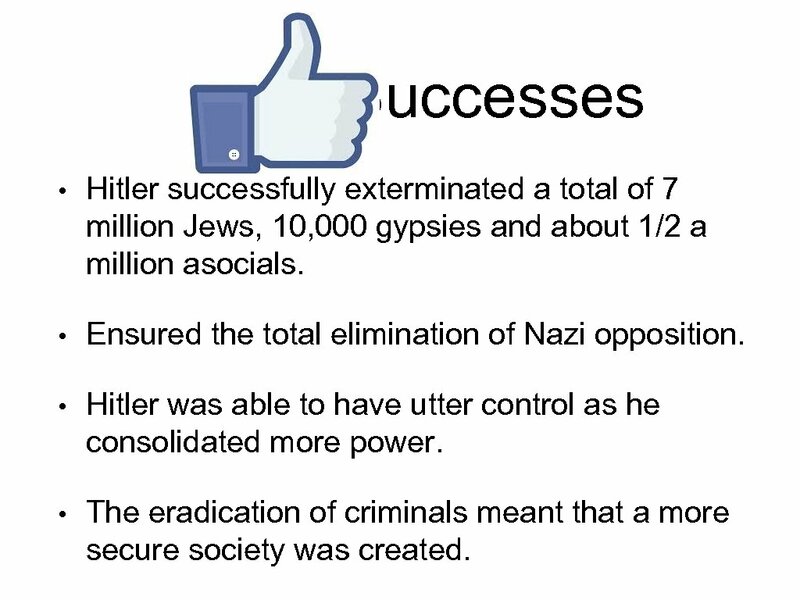 Successes • Hitler successfully exterminated a total of 7 million Jews, 10, 000 gypsies and about 1/2 a million asocials. • Ensured the total elimination of Nazi opposition. 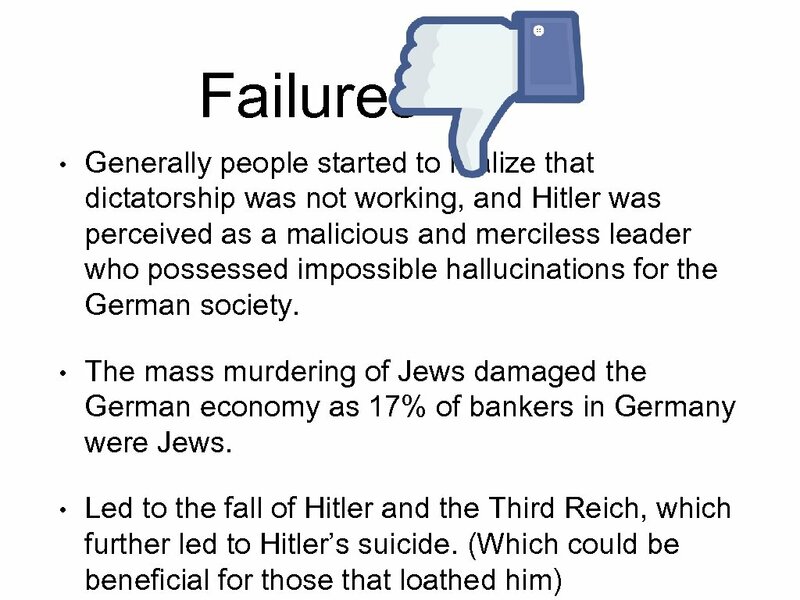 • Hitler was able to have utter control as he consolidated more power. • The eradication of criminals meant that a more secure society was created. 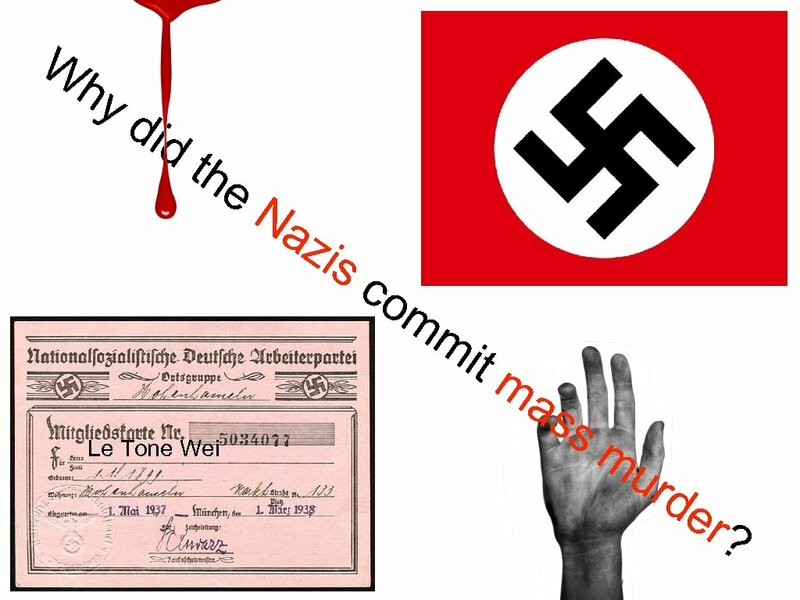 Conclusion: Why did the Nazis commit mass murder? • In order to follow Hitler’s will: • Anti-semitism. • Superiority • (Mein Kampf) of the Aryan race. Conflicting departments of the Third Reich competed against each other trying to come up with solutions and policies that would best fall under Hitler’s will. • To gain power in the party. ibliography • Todd, A. & Waller, S. (2012). 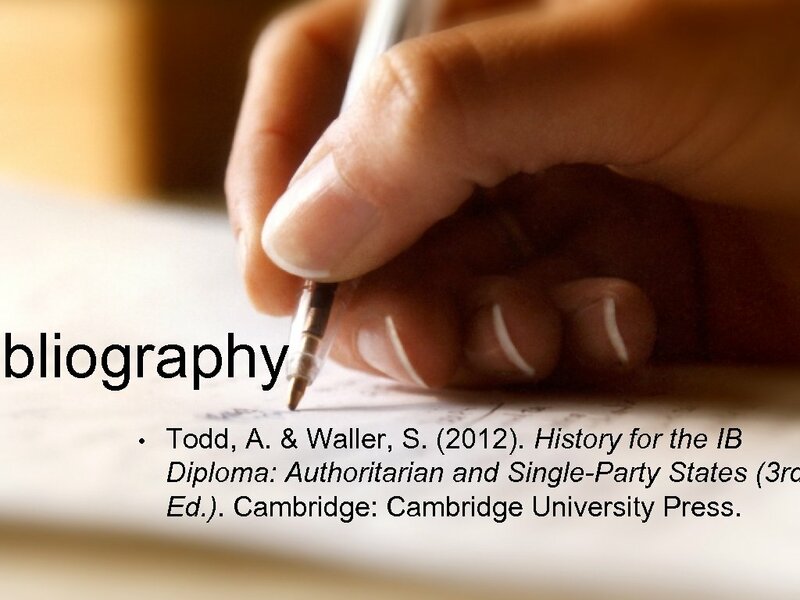 History for the IB Diploma: Authoritarian and Single-Party States (3 rd Ed. ). Cambridge: Cambridge University Press.